Seven Drunken Nights BC/Alberta Tour! Newfoundland St. Patrick’s Day Party! $19 for dinner / $10 for dance. Call 780.425.8654 for tickets or more details. $20 – All ages show. Caledonia Brewery & Distillery Anniversary Party! 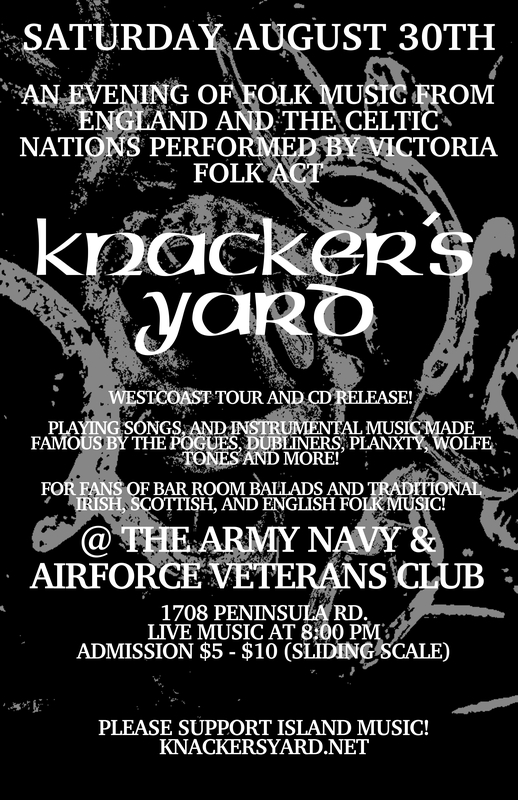 Public: Knacker’s Yard fans welcome! Doors at 8:00pm Tickets $10 at the door. 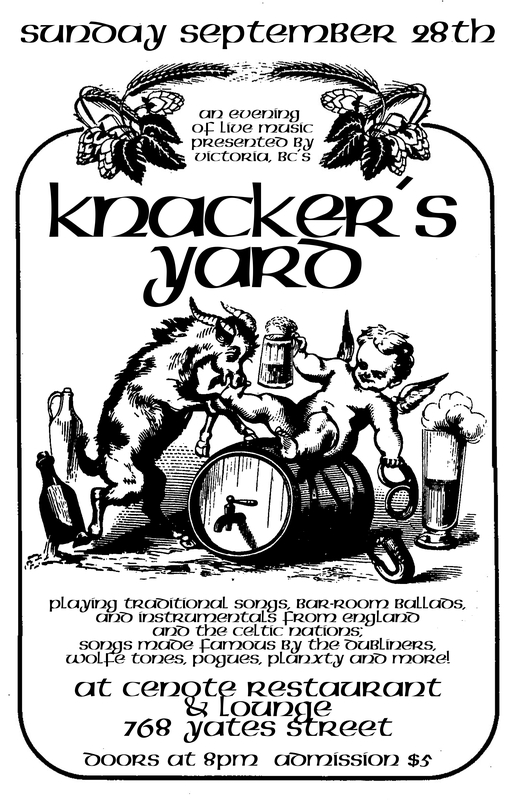 Join Knacker’s Yard at The Irish Times Pub every Monday and starting every Wednesday on September 12th! We play three sets every evening between 9:00PM – 12AM. See our upcoming schedule for dates! Recording with Joby Baker April 9th-11th! Free: Kids welcome until 9PM! Private event: Bryden’s 50th B-day! 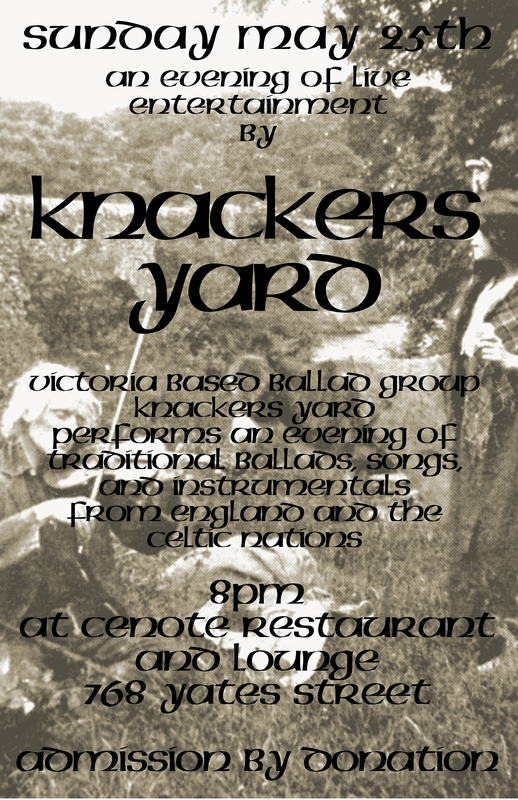 Knacker’s Yard Party on Protection! Knacker’s Yard in the Studio with Joby Baker! 11am-12 noon: show to tell for the kids! Join us for all three appearances! 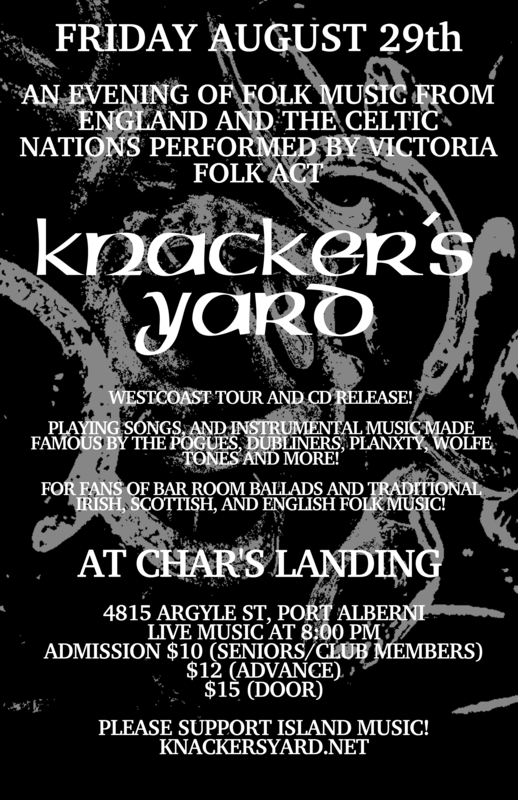 Knacker’s Yard returns to Port Alberni! 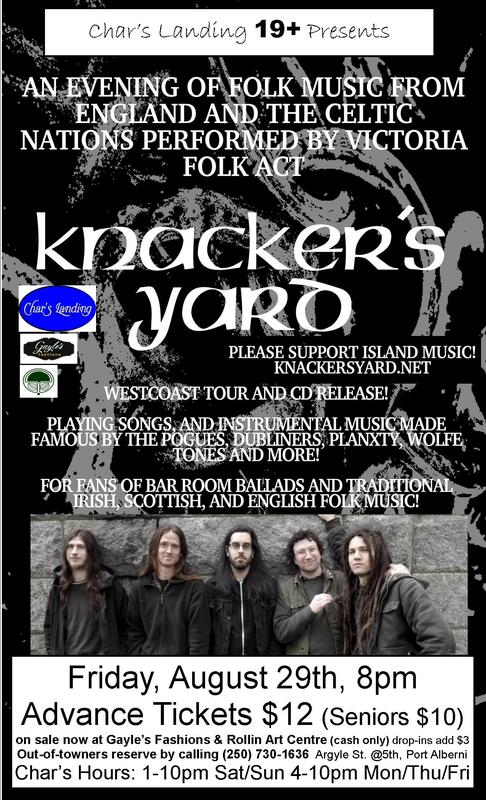 Knacker’s Yard Returns to Ukee!! St. Paddy’s Day Afternoon Show! Only Irish music for this one! St. Paddy’s Day Evening Party! 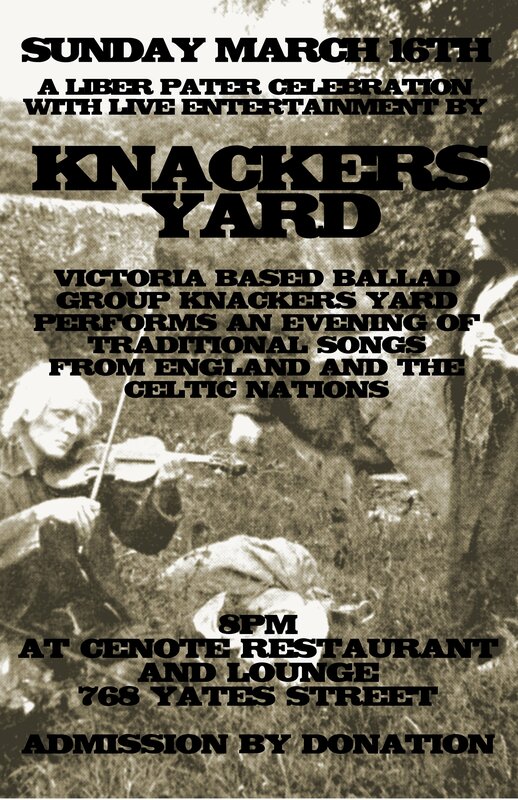 An evening of live Celtic music and dancing! Private Event: Back yard party! 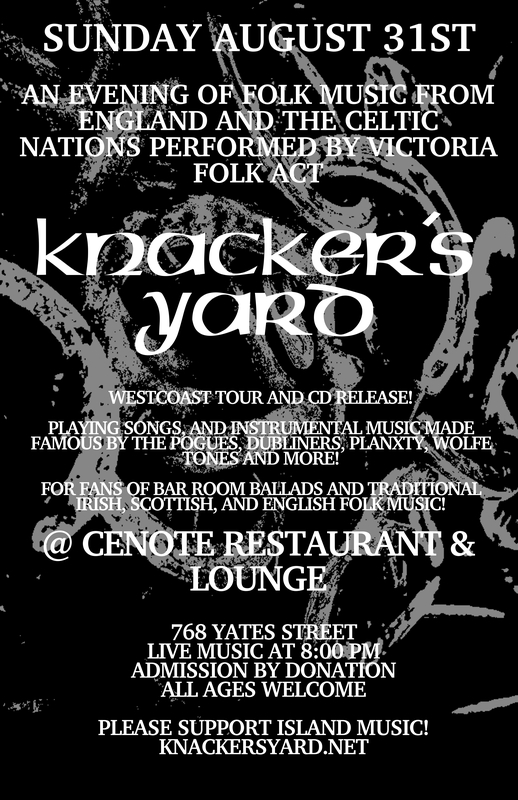 @Corner of Menzies St. and Superior St.
Knacker’s Yard Returns to the Caleb Pike House! St. Patrick’s Day Celebration Part I! St. Paddy’s Day Celebration Part II! St. Paddy’s Day Celebration Part III! Free entrance until full, after which there is a door charge. So get there early! Tickets are $10.00 at Oldfield’s Save-on Gas Station, where there is also a sign up sheet for potluck dishes. @ Fourth Ave, Sidney, B.C. This is a free public performance! All brands of motorcycles, everyone welcome!